Dunkin’ Donuts is boosting the customer experience in its drive-thru lanes with three-screen outdoor menu displays that can tailor ordering options by varying conditions, and likely one day, vehicle by vehicle. Menu display content tailored to each car and SUV is the “dream state” for Paul Murray, director of digital innovation for Dunkin’ Brands, the world’s leading coffee and baked goods chain. For now, though, the chain is taking more conservative steps, running a pilot program that started last fall in 10 franchise locations. The outdoor displays are 46-inch Samsung OH series high-bright displays housed in a 3×1 enclosure array set in portrait mode. Franchise operators love what they’re seeing in terms of the upgraded customer experience, explained Murray at the Digital Signage Expo trade show in Las Vegas. Murray co-presented the session — Transforming the Customer Experience in the Drive Thru Lane at Dunkin’ Donuts — with Ron Gazzola, senior vice president of B2B IT Sales & Marketing for Samsung Electronics America. With as much as 50 to 75 percent of QSR orders rolling through drive-thru lanes according to NPD Group, marketing to motorists can have significant bottom-line impacts. Gazzola shared with the audience some of the findings from a recent Forrester Consulting study on outdoor displays in drive-thrus. 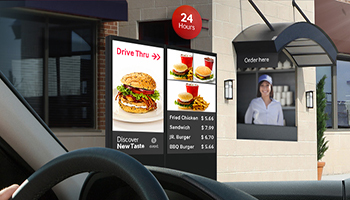 The study’s total economic impact model for outdoor digital menu boards suggested investing in the technology would have a significant benefit over the back-lit posters traditionally used for drive-thru order stations. For a 10-location pilot, increased customer volume, order value and improved promotion conversions resulted in a more than $1.4 million profit increase, while savings on labor, administration and printing expenses totaled more than $1 million over a five-year period. Dunkin’ Brands is keeping the sales impact results of the pilot to itself for now, but Murray said the company is seeing positive results. The ROI model is still being refined and Dunkin’ Brands is doing intercept surveys with customers to get their feedback. Gazzola noted how Samsung’s modular approach to drive-thru displays is making the process easier for all QSR operators and their technology partners, notably those already supplying analog menu stations. Samsung has done all the “heavy lifting” regarding engineering design, weatherproofing and vandal protection, allowing sign companies to focus on the enclosure work they already know. Murray told the crowd a big benefit the chain is seeing from digital is the ability to tailor messaging more dynamically, based on real-world conditions, as opposed to what’s expected based on history. Murray said that the need was obvious with recent weather swings in the northeastern U.S., with some days in February so warm that pushing iced drinks made more sense, while March was cold and more suited to marketing hot coffee. Gazzola suggested that smarter, data-driven outdoor menu displays are part of a larger trend of customer-facing screens harvesting and using data from Internet of Things devices and sensors, along with retail management systems, to generate insights and provide more relevant and timely messaging to consumers.